My husband went to the butcher's on the weekend and bought too much as per normal. Now I do freeze meat quite often but I don't really like to freeze steaks as such, I prefer to eat them fresh once they come home from the butchers. So after he made a barbecue on the weekend, I had three steaks left over. At first my husband suggested a beef and broccoli stir fry, but I was not in the mood for that, so I suggested I would try something new. I have a very large collection of cookbooks and have decided I am going to pick one cookbook per week and use that book when trying something new for that week, then change books. This weeks book is Nigella Lawson's Nigellissima. So far I am loving this book, I have tried the Meatzza, absolutely delicious. The Chocolate Hazelnut Cheesecake, brilliant, the Chocolate Olive Oil Cake which is great for those that can't have dairy or gluten, absolutely delicious, and tonight I am trying an Italian Apple Pie. This steak recipe is in that book, here I learnt that you pronounce Tagliata like this Tallyata and that tagliare simply means to cut. This is how I like to eat a steak, I have never really liked getting a big steak on a plate and eating it myself, I love thin slices of rare steak on a shared platter with either a delicious rub, or like this with a sort of dressing, served with a salad, absolutely delicious. Here you cook the steak for 2 minutes in a griddle pan on each side (cook your steak longer if you prefer, that is totally up to you, this is just how my family love it). Then you place the steaks in the prepared dressing, slice it up, add the tomatoes to the dressing, that is it. Then serve with some crusty Italian bread to soak up the dressing and dinner is done, very easy and tastes amazing. I love the simplicity of this dish. 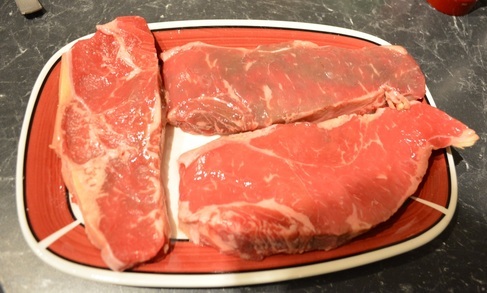 Take out the steaks out of the refrigerator an hour before cooking them, they are best cooked when not fridge cold. If by chance you have forgotten to do this, cook the steaks a minute longer on each side. If you don't want to fry the steak indoors, this can also be made after the meat has been cooked on the barbecue, I know I'll be having my steak like this next time we barbecue. Now the recipe below is for two as the name suggests, but as I had three steaks I tripled everything except the tomatoes, as I only had one punnet at home, but in all honesty three punnets would have been too much, especially as I used smaller grape tomatoes. So adjust things to your liking if doubling the recipe. I loved the chilli in this it added a nice heat that the dish needed, but you put in what you can handle. I did serve it with a salad but in all honesty, the tomatoes add the salad element, so you don't have to bother with a salad. 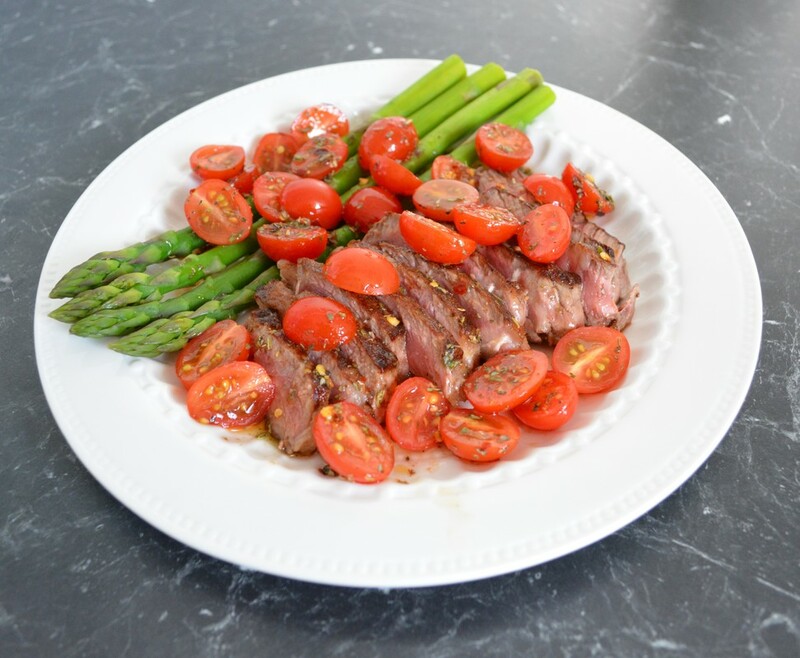 The recipe states to use sirloin steak, but I have also made this with new york steak and it was equally delicious. So if you are looking at sprucing up a steak, this dish will do it. Super easy, super tasty, I know I'll be making this again and again. Heat a griddle, or cast iron or heavy based non stick frying pan over high heat until hot. Oil the steaks lightly on both sides, season with a little salt and pepper, to taste, remember the dressing has salt, so don't over salt. In a small dish that can just fit the steak later, combine the extra virgin olive , chilli flakes, dried oregano, salt and red wine vinegar. Give it a little stir to combine. Place the steaks in a dish where they fit snuggly. Place the lightly oiled steaks on the hot griddle (or in the hot pan) and cook for 2 minutes on each side (cook longer if you don't like it rare, as 2 minutes gives you a rare steak as pictured). Once cooked to your liking place the steaks immediately into your chilli marinade and sit the cooked steak in the marinade for 2 minutes on each side. 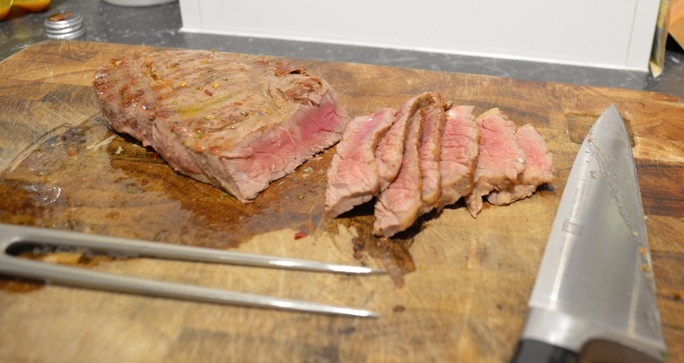 Remove the steeped steak to a chopping board. 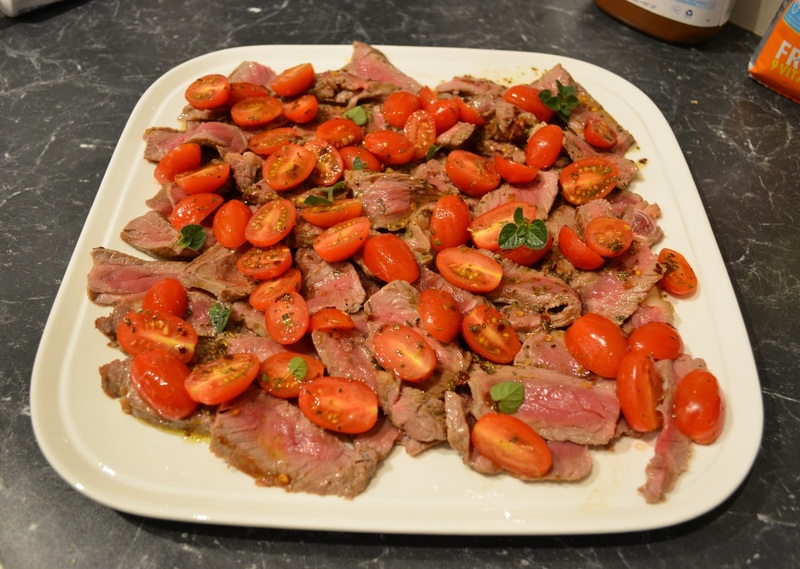 Place the tomatoes cut side down into the warm chilli marinade, leave them there while you slice up your steak. Cut the steak into thin slices on the diagonal and arrange on a serving dish or 2 dinner plates. Slice thinly and slice on an angle. 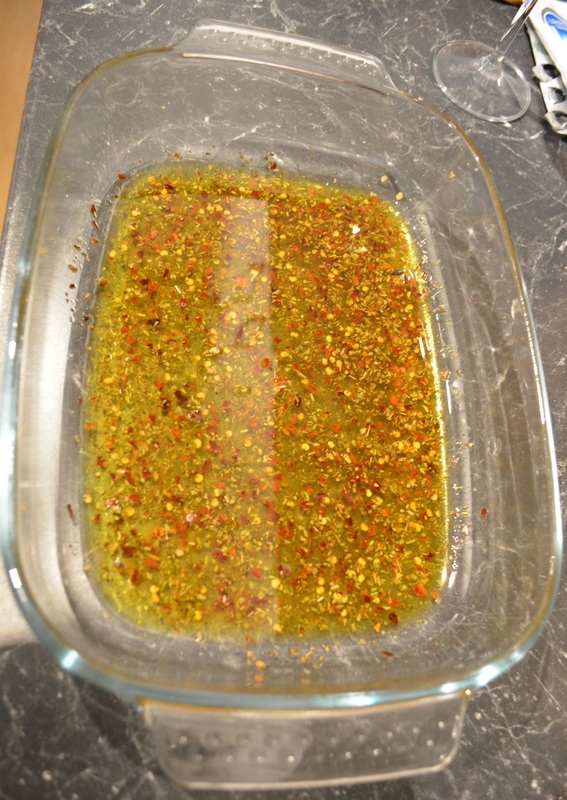 Mix the tomatoes around in the marinade, then pour them and the marinade all over the ribbons of meat. Add a few leaves of oregano, if you have them, I grow them so they are readily available, and serve immediately with some warm Italian crusty bread.